How do, Monday, how do indeed! The sun is shining, air is crisp & we've a full week of possibility ahead. 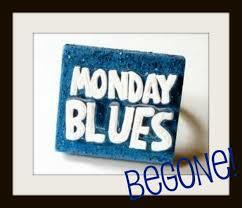 As ever I'm shining a light on my silver linings & the Moments that mean there's no Monday Blues for me. I'd love to hear about the little things brightening your day and your week too! 1. Heading to an event last week with Corrina, I made the schoolboy error of eating, while wearing a light pink top. Of course the second fork full landed front & centre. Scarfless for the evening I thought all was lost until Corrina produced 2 bags of clothes shopping she had done that day! Thanks for saving my sartorial bacon, Sis. To everyone that walked in on our impromptu Gin Palace bathroom fashion show, I'm sorry! 2. From those very bags she also produced A GLITTERY FLAMINGO PEN!! You'll know by now my obsession with those pink eejits. I'm currently standing behind my door with it in hand, hoping a delivery man shows up looking for a signature! 3. Hopping on the bus last week I was crossing my fingers that I'd one trip left. Once it beeped I caught a flash of '€17.70 credit remaining'. Turns out Aaron had borrowed it for one trip but topped it up with €20 before returning it! He's a good egg that one. 4. I mentioned last week I've been enjoying a diet of dust & twigs in the run up to New York... This pay day was one of my favourites so far. Turns out I was entitled to an increment a long time ago. Without badgering or even the slightest encouragement my back pay turned up! The timing could not be better. Sometimes sticking with the day job REALLY does pay! 5. We found out this weekend that the youngest Gorgebag & his Gorgeous Girlfriend, Lauryn won Best Dressed for their Debs! I know I'm biased & a Mama always thinks her little 'uns are outrageously handsome but LOOK AT THEM - I'm over the moon for them. Tell us, what's made it to your top Monday's Moments this week?